The Boy Scout Tree Trail is by general agreement the best hiking path in Jedediah Smith Redwoods State Park, and amongst the finest in all the redwood national and state parks, owing to the large size of the trees, the tranquil atmosphere, the abundant ferns and other undergrowth, the patterns of sunlight (since fog is relatively uncommon here), and the varied surroundings, which include hills, ravines and flat valley floors. 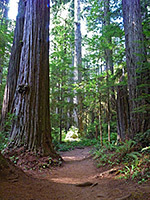 There are countless huge, old-growth redwoods here, but the route is named after a particularly large specimen, discovered by a local scout leader. 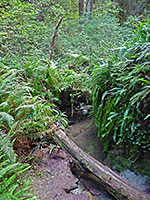 One added highlight, right at the end of the hike, is Fern Falls, where a little creek flows down a steep slope through a succession of pools and cascades lined by ferns, yellow monkeyflowers and other vegetation. Although relatively long (2.6 miles), and remote - reached by the narrow, unpaved Howland Hill Road which has limited parking - the Boy Scout Tree Trail is often rather busy, but not to the extent of spoiling the peaceful atmosphere. 24 views along the Boy Scout Tree Trail: gallery, slideshow. The seven mile Howland Hill Road runs between Douglas Park just off US 199 and Elk Valley Road near Crescent City, mostly following the thickly wooded valley of Mill Creek. The majority (5.5 miles) is unpaved, and the road is in general wide enough for only one vehicle, albeit with regular passing places. The trailhead for the Boy Scout tree is 3.8 miles from the west end and 3 miles from Douglas Park in the east. Beside the start of the trail is enough parking for maybe a dozen cars, with more spaces available on nearby verges. All vegetation next to the road has a permanent covering of whitish dust deposited by passing traffic, but otherwise, the predominant color of the woods is dark green, from a healthy mix of ferns, bushes, wildflowers and of course trees. 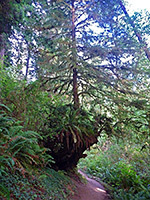 The land at the start of the trail is flat, part of a wide section of Mill Creek valley, and is covered by many big redwoods growing close together, creating a good variety of scenes, as is often the case in redwood forests, such as fern-covered rocks, ancient upright stumps, smaller trees growing on horizontal fallen trunks, and moss hanging from branches. The path follows a flat-floored tributary ravine northwards, crossing a tiny creek on a bridge then climbing gently up a ridge, traversing a way before passing over the crest. 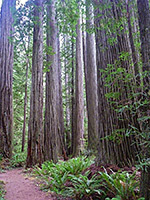 The surroundings here have a little more undergrowth than lower down, and more of a mix of differently-sized redwoods. Some young trees a hundred feet or more tall are going above the ground on old, fallen trunks, still firm and intact. The hillsides on the far side of the ridge are more open, allowing far reaching views ahead, over the adjacent, wider valley of Jordan Creek. The trail descends slowly, then a bit more steeply, still passing plenty of large redwoods, down to a footbridge over a stream (the very upper end of Jordan Creek), with steps before and after. The ground is uneven for a short distance, criss-crossed by innumerable exposed, slippery roots. Another bridge traverses a smaller stream, as the path becomes fairly level, though quite high above the valley floor to the south. Next is a longer side ravine, the path winding in and out, followed by a junction with the short but steep spur to the Boy Scout Tree, which is a conjoined redwood, the two trunks merged at the base to form an unusually wide trunk. An aged notice fixed high above gives the name of the tree. This location is quite close to the western edge of the forest so some of the neighboring trees are rather smaller, allowing a greater proportion of the sunlight to reach the floor, and hence more undergrowth to flourish. Past the Boy Scout Tree junction, the main path descends to another creek, and ends right at the foot of Fern Falls, though a fainter trail continues a quarter of a mile to the abrupt boundary of the forest, which adjoins private land so there is no official access to nearby Elk Valley Road. Apart from seep-spring monkeyflowers beside the stream, wildflowers are quite limited along the trail - the few other species include green-leaf rattlesnake-plantain (goodyera oblongifolia) and redwood sorrel (oxalis oregana). 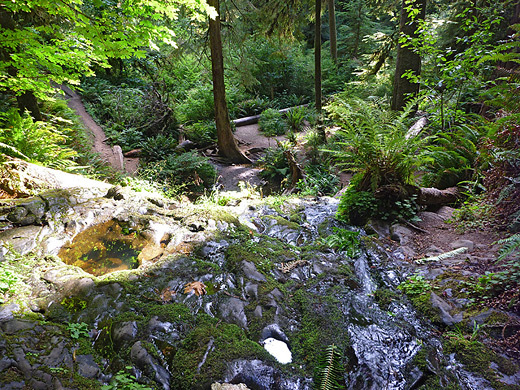 Fern Falls, at the end of the trail (o:50 min).